So, I think I will rather let images do most of the work of this post. I read, with interest, the Presiding Bishop’s Easter message. I have given myself a couple of days to ponder it as I am loathe to string together posts that seem excessively pessimistic! However, after an absolutely lovely Palm Sunday Mass complete with a stunning chanted Passion, a sermon of substance and depth, prayers replete with the complexities of this day, I began to think about what it is that draws people back to church – back to hear something of the faith and of the salvation promised through Jesus Christ. 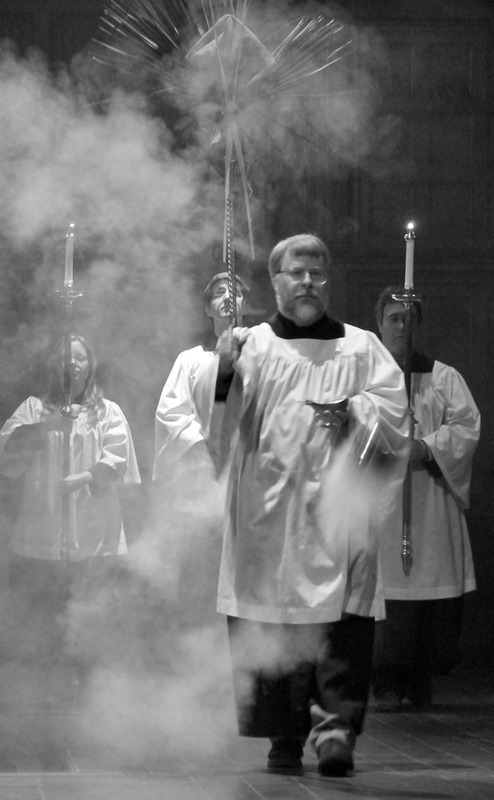 Beauty, complexity, drama, struggle, and hope were all found in a liturgy that, as fully as we could manage, sought to give a glimpse of some part of the mysteries of Holy Week. We struggle to give voice to unspoken doubts, to offer a glimpse of undecipherable mystery, to raise our hearts and minds to contemplate the victory of the cross, and to draw all in some way closer to the humanity and divinity of Jesus Christ. 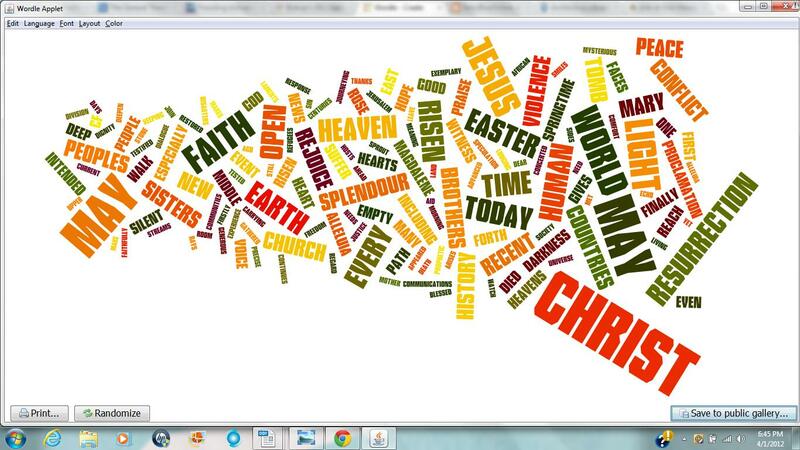 I am attaching, below, word cloud images of the Easter messages of several different leaders from various Churches and denominations – and an Easter message from the outspoken atheist Ricky Gervais. The troubling thing about the Presiding Bishop’s Easter message is that it is conspicuous in that it does not mention Jesus Christ or God. It sounds much like a rather vague message about new life in spring – perhaps an ad for seeds, fertilizer, or a non-profit designed to appeal to the vaguely spiritual crowd that follows Oprah’s booklist with devotion. One could read it or a Walt Whitman poem and find similar themes of natural beauty and struggle. I do not see anything about the decisiveness of the Resurrection or the great gift given to humanity in the person of Jesus Christ. 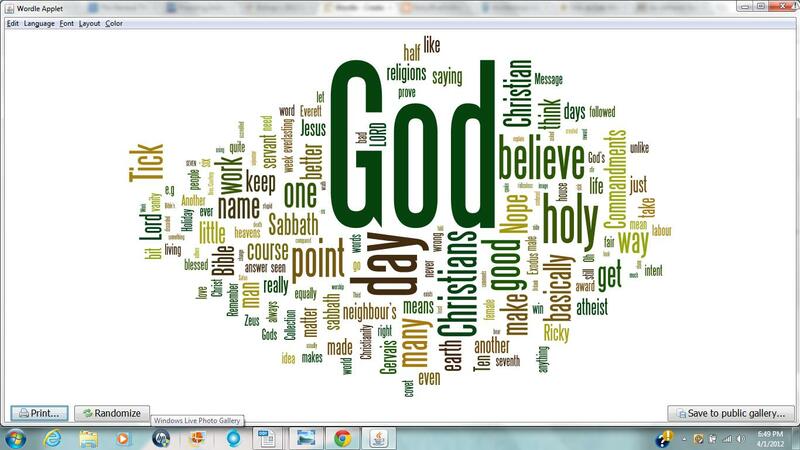 One does not see God the Father or the Holy Spirit in the word cloud either. 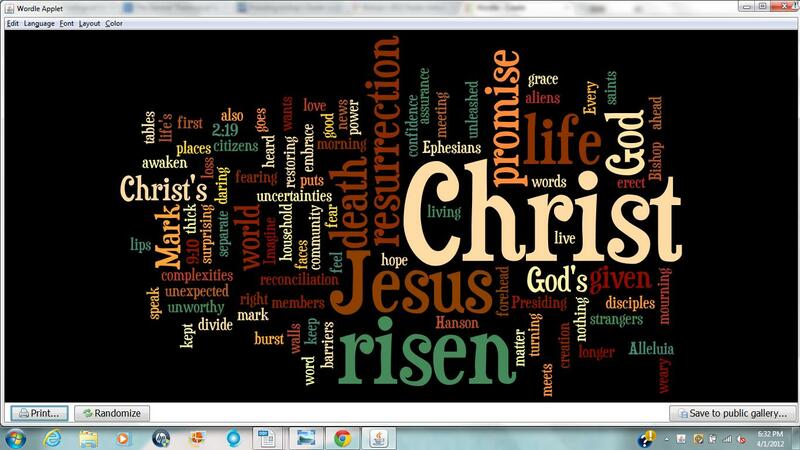 In other words, it is an Easter message without the true, great hope that is Easter. Resurrection is presented as a theme to be found in the world around us rather than as an act of love that upends the very nature of the world. I am not one who takes delight in speaking ill of the Presiding Bishop or her office – hers is no easy task. But I opened that Easter message looking for hope and news of God’s great gift and found an Easter message that said much about the day of Easter but not about its source, meaning, or Truth. 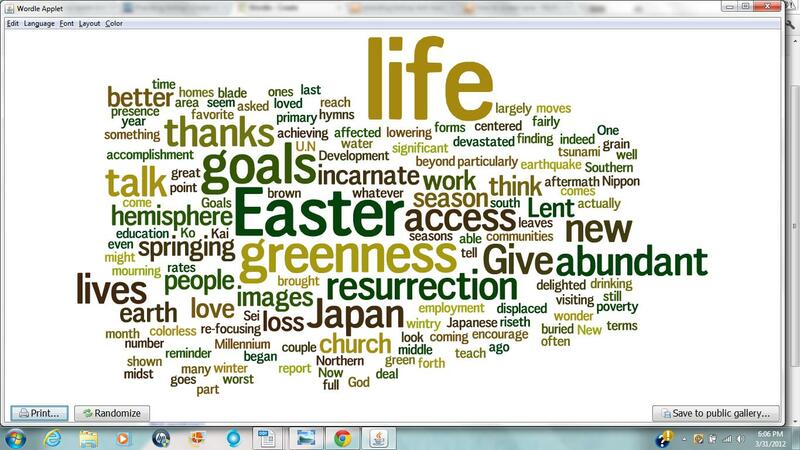 It focused on resurrection as a process (with a small R) rather than as a victory that destroyed death. 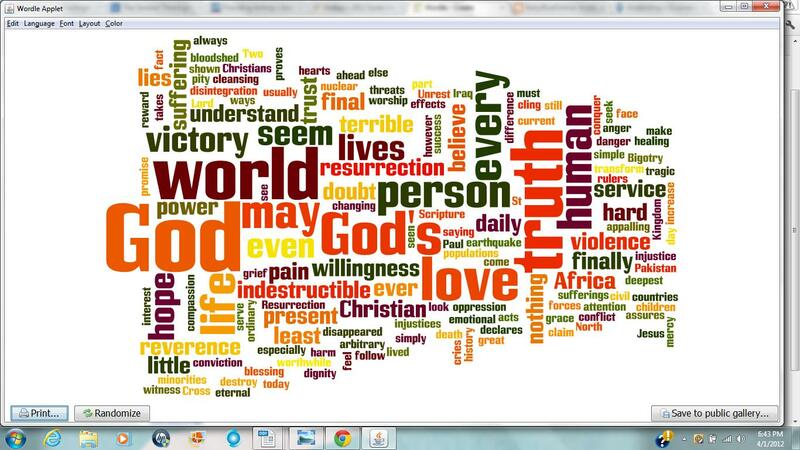 What I found was a message profound for what it lacked – news of God’s mighty acts in the person of Jesus Christ. Your moving description of the Palm/Passion Sunday liturgy at Christ Church made me more than mostalgic for the beautiful and faithful worship there. It, indeed, does have great substance–the great weight of the Gospel and Biblical narrative of redemption. Your reaction to the latest message from 815 is an objective, accurate and thoughtful analysis. The lack of the Gospel of God in the woldviews of the leadership of many, if not most, legacy mainline denominations is symptomatic of why there is such a tragic decay and self-destruction that has strong momentum. Sad to say that I agree with you. If Easter is not a prime opportunity to speak of our faith in the Risen Christ, why bother at all? Please don’t insult Walt Whitman by comparing him to the PB! Compared to her, he’s a regular starets. So, as near as I can tell, the definition of fulsome is in some flux. A search for synonyms reveals both the definition you offered and the one I intended. I suppose, depending on one’s churchmanship, our liturgy is always found fulsome. When did something as positive as “fulsome” morph to a negative connatation? Strange business. I took it in its older, blessed meaning. Of the numerous letters I have read by the POB not one has mentioned Jesus Christ. Much as I want to support her work, I am grieved by this – again and again.